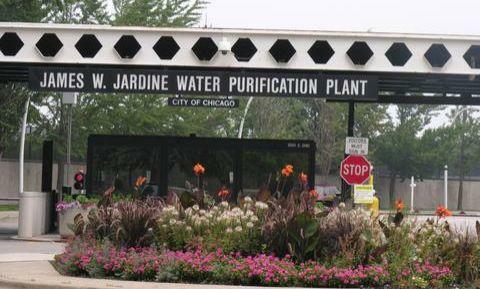 Chicago Department of Water Management had a Picnic today at the Chicago Jardine Water Plant. Since it was overcast the Air Show got off to a slow start. I think the new Commissioner seems more relaxed than the last batch. When I arrived, I had to pull to the side because my I.D. was not ready. Thanks for making my kids I.D. Luci. I registered for this event prior to May 25, 2006. I also donated my services as a photographer since I am published. When I arrived at the plant we were having a nice time and than decided to get pictures with two helicopters in the front of the plant. When we arrived some lady was talking pictures and I asked if I could also. No sooner than I reached for my camera than two people in orange shirts were screaming for me not to take pictures. My son, an eight year old showed the lady other people taking pictures. I put the camera away in a polite manner. Of course I never received any notice from security not to take pictures. I went back with my family to the North side of the plant and upon returning to my picnic area a moron came out of a blue truck screaming at me. He ordered my son to leave and I told my son to stay. This clown did not wish to hear my side of the story, showed me his I.D. and said he let me in the plant. He also said he knew I donated my services to take pictures. I asked why did he not let me know if I was taking pictures or not. I think the lack of professionalism this person showed was a disgrace. The non-union security force on hand was S.P.I. Do they have the background checks I went through? The paranoia the Chicago Water Management showed towards me was in poor taste. This happened at 1:20 p.m. today. I think this dude was Rob O’Connor a brother of a Chicago Alderman. Keep your clout at home, a family picnic should be fun with family pictures to cherish. If anyone thinks the bad guys do not know the layout of the jardine plant, your sadly mistaken. Chicago Union Employees would never disclose information to terrorists, so do not sell that garbage. If you are worried about the “Enemy”, investigate the contractors and contracts, does security not apply with Clout Companies? The 39th and Iron Water Plant is visited by contractors with no I.D. or clearance. Fake non-union cops at Jardine? Photo outside plant by Patrick McDonough. P.S. all public can take pictures there. Every time McDonough takes pictures someone goes to jail. Or is in the Newspapers. Why don’t you do security McDonough, that is your calling. Big Lou. The plant is loaded with video cameras, your treatment has no bearing on the New Commissioner of Water Management. One of the guys taking pictures was Robert Cueva, he is a nice guy that works with the Water Meter Assessment Division. You can reach him at 1-312-745-1005. I do not think he has F.B.I. clearance, so do not believe Pestka’s spin. At the Picnic the Acting Commissioner said Pestka and O’Connor did a lot for the picnic’s success. I hope they did not do it on City time. C.I.A. Sammy. Let us get something straight, I asked the security guards if they were in the union. They not only responded no, but said they need a raise. Some companies are union for some employees like Marina Trucking. Digby’s security is non-union, many employees on Chicago city sites have waited over four months. A union company means all employees union. Get your facts straight. They let in a church van from Fellowship Missionary Baptist Church. The church is located at 45th and Princeton Ave. Chicago Illinois phone number 1-773-924-3232 contact info http://fellowshipmbchurch.org/ I guess you do not need any I.D. at this high safety zone if you got the right clout.